SAN DIEGO (CNS) - A family of four escaped their burning home Wednesday morning in San Diego's Pacific Highlands Ranch neighborhood near Carmel Valley, but their garage and two vehicles were destroyed by the fire and smoke damaged much of the home, causing a loss of about a quarter-million dollars, authorities said. According to officials, the home was equipped with new smoke alarms that alerted the family and allowed them plenty of time to escape unharmed. Personnel from the American Red Cross responded to assist the family find temporary shelter, Munoz said. "Fortunately, no one was hurt and the damage was mostly confined to the garage, with a bit of extension into the second-floor bedroom above the garage," Munoz said. 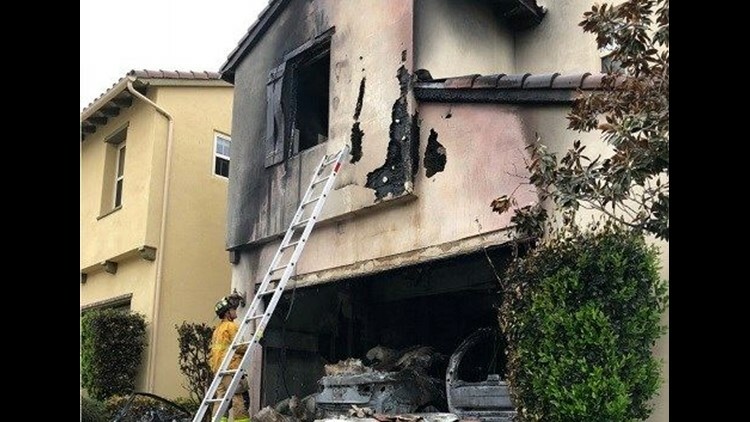 "The combination of the fire door between the garage and the home, and quick action by firefighters, saved the first floor of this home from burning." Metro Arson Strike Team investigators were on scene, but were unable to determine what caused the blaze.